Rubrics Across Disciplines at SLA. 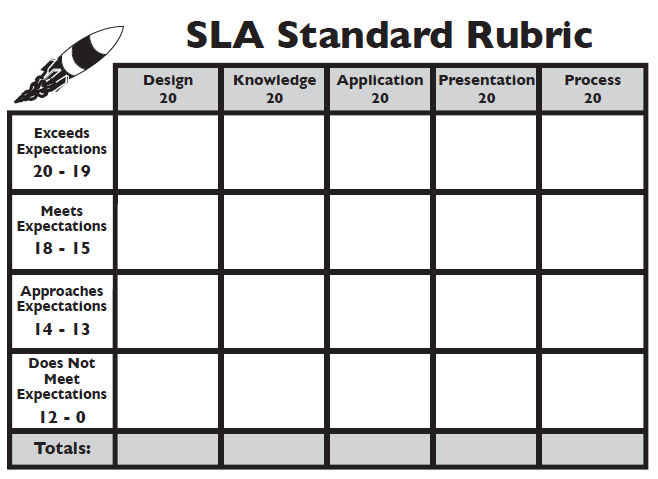 My last post included the rubric for the Independent Reading Project — but there have been some requests for an overall discussion of rubrics at SLA. Students at SLA are assessed through a variety of means with a focus on project-based learning and our five core values of inquiry, research, collaboration, presentation, and reflection. Our students do not take the School District of Philadelphia benchmark exams; rather, they complete projects in every subject that are assessed based on the SLA rubric (see below). The descriptions in the empty boxes are filled in according to the subject and project nature. There are a thousand directions I could go in discussion of this rubric — but I want to focus on formatting, and how that influences student understanding. The categories ensure that teachers provide more than just a checklist for students. Specific items or tasks can be listed in each section of the rubric, but the categories ensure there is a deeper meaning to what’s being assessed, instead of just checking that everything is in place. For the project, students had to research applications of various types of derivative functions, and then design a webpage demonstrating derivative applications. Their page had to include original problems and solutions for each type of derivative function, as well as analysis of what each derivative function represents. Design of website and original problems Website flawlessly illustrates applications of derivative functions and demonstrates how to differentiate various types of specific functions; all 8 topics are included. website clearly illustrates applications of derivative functions and demonstrates how to differentiate various types of specific functions; 5 topics are covered and meet expectations. website mostly illustrates applications of derivative functions and demonstrates how to differentiate various types of specific functions; 1 topic is missing or not covered; website approaches expectations. website does not demonstrate applications of derivative functions or how to differentiate types of functions; multiple topics are missing or incomplete. Using different rules and techniques to find derivative functions All derivative functions are found flawlessly for all 8 types of functions; solutions and uses of different techniques exceed expectations (simplified completely). All derivative functions are found without error for 5 types of functions; solutions and uses of different techniques meet expectations. Most derivative functions are found for 4 types of functions; project contains 1-2 errors; solutions and uses of different techniques approach expectations. Project displays weak and minimal knowledge of derivative functions; derivative functions are missing, incomplete, or contain many errors. Application of different techniques to find derivative functions Flawless analysis of derivative functions for all 8 types of functions, including the process of finding the derivative and the meaning of the derivative for the specific problem. Accurate analysis of derivative functions for 5 types of functions, including the process of finding the derivative and the meaning of the derivative. Somewhat flawed analysis of derivative functions for 4 types of functions, including the process of finding the derivative and the meaning of the derivative. Explanations and/or analysis have one/two mistakes or one type of function is not included. Highly flawed or incomplete analysis of types of functions; techniques for finding derivatives are missing or incomplete, and not analyzed at all. Completion of project All parts of the project are completed on time and beyond the necessary requirements. All parts of the project are completed on time and meet the necessary requirements. Most parts of the project are completed on time and meet the necessary requirements. Many parts of the project were missing or incomplete. Presentation of website website is superbly written and polished; methods to find derivative functions are flawlessly demonstrated and presented; all aspects of the website exceed expectations. website is well constructed and polished; methods to find derivative functions are demonstrated and presented; all aspects of the website meet expectations. website is pretty well constructed with a few mistakes; methods to find derivative functions are demonstrated and presented with 1-2 mistakes/omissions; most aspects of the website meet expectations. website is not well composed with several mistakes; methods to find derivative functions are not demonstrated or presented; almost all aspects of the website do not meet expectations. Here’s another example from Latimer’s classroom, where he chose only to detail the “process” section for every category. For the project, students were partnered up, and each pair was given a different investment and credit situation. They then had to research five different options (bank, lenders, credit cards, etc) to deal with each situation. The final product was a detailed research paper which made a recommendation on the best option for their specific situation, and included mathematical justification (using exponential functions and compound interest formulas). Design of paper Paper is well designed; all required components/sections are complete; 5 different savings and 5 different credit options are covered, and all calculations and citations are included; individual work is also included. Knowledge of key concepts involving exponential growth and compound interest All mathematical calculations are correct and meet expectations for 5 investment and 5 credit options. Application of knowledge of exponential functions Analysis section of paper clearly and accurately applies knowledge of exponential functions to specific situations; conclusions for your situations are clearly explained and justified using mathematics. All parts of the project are completed on time and beyond the necessary requirements; excellent use of all in-class work periods All parts of the project are completed on time and meet the necessary requirements; all in-class work periods are used effectively Most parts of the project are completed on time and meet the necessary requirements; effective use of most in-class work periods Many parts of the project were missing or incomplete; ineffective use of in-class work periods. Presentation of paper Final paper is polished and professional in appearance. There are no typos, and all required sections of the paper are included. I think it’s relevant that this is a 4th quarter project — at this point it should be clear to many students what the expectations of the class are, and to mentally fill out the details of what exceeds, and what does not meet, the expectations of the class. Many thanks to Brad Latimer for sharing this content and making this post possible. Let me know if there are other disciplines you would like to see materials from. This entry was posted in Curriculum, SLA and tagged core values, rubrics on February 6, 2013 by lpahomov. Thanks so much for sharing. It’s always nice to see different ways of assessing students.